FIG. 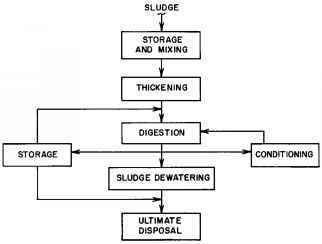 7.21.2 Conventional activated-sludge plant flow sheet. In a conventional plant, the oxygen demand is greatest near the influent end of the tank and decreases along the flow path. Plants built before the process was well understood provided uniform aeration throughout the tank. A conventional plant cannot accommodate variations in hydraulic and organic loadings effectively, and the final clarifier must be sized to handle a heavy solids load. Usually aeration units are in parallel so that a shutdown of one unit does not totally disrupt plant operation. Modifications have evolved as the activated-sludge plant has become more widely used and are described in the following paragraphs. One technique that furnishes more uniform oxygen demand throughout the aeration tank is introducing the primary settled waste at several points in the aeration tank instead of at a single point as in the conventional process. This modification is step aeration, and Figure 7.21.3 is a typical flow diagram. The percentage of settled, activated sludge returned to the aeration tank is usually greater than in the conventional process (about 50% typically), and the detention time is reduced to 3 or 4 hr since the loading is more evenly distributed in the tank. Additional piping and pumps are required to distribute the waste to several locations; however, the improved performance is considered to be worth the expense. A less popular alternative to distributing the load to the aeration tank is to provide different quantities of oxygen along the tank length, related to the oxygen demand that gradually decreases along the tank length. 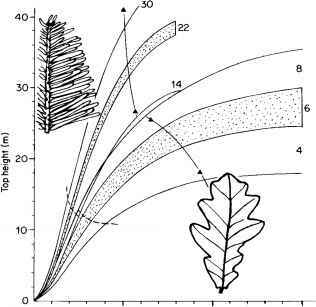 The flow sheet for tapered aeration is the same as that in Figure 7.21.2. The disadvantage of tapered aeration is that although it is more economical due to reduced air quantities, it can only be designed for one loading. FIG. 7.21.3 Step-aeration type activated-sludge plant flow sheet.